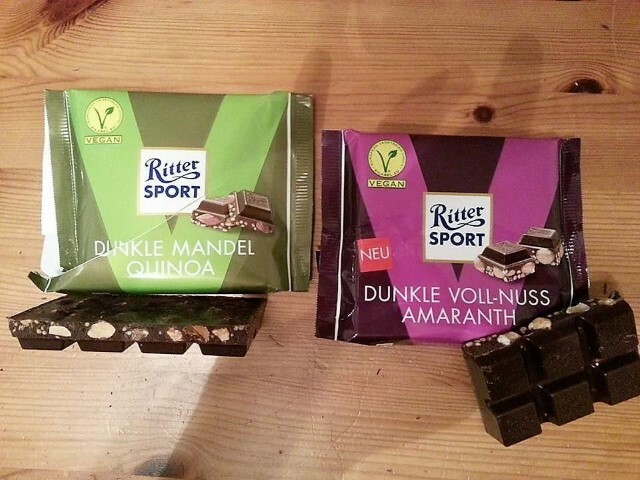 Just a little less than a month ago, we wrote about Ritter Sport’s two new vegan bars, made with Nicaraguan cocoa and hazelnut cream. As they are currently only available in Germany, I of course made a mental note to look for them when, almost a month later, I would be in Germany (check out my review of Veganz here!). I bought both for a post-dinner sampling and treat. As you can see in the photo above, the first option is made with quinoa and almonds, and the second, which is apparently the “new”-er option, with amaranth and hazelnuts. Other than the flours and “crisps” of either grain and the nuts chosen, the ingredients were essentially identical. The first thing I noticed was that the hazelnut cream made both bars–including the runner-up–much tastier and creamier than the standard dark chocolate bar. The grains were also a surprisingly nice twist, making both options have an enjoyable and light crunch. For some reason, I automatically assumed that I would enjoy the quinoa/almond one more, but after trying both, the amaranth/hazelnut option was definitely the winner for me, which tastes like Nutella–only much less sweet. While both grains were a nice addition, the amaranth “crisps” were a little more airy, making them reminiscent of rice crispies–always a plus. I even learned from my German company that the way I opened the packages of chocolate was incorrect (see header photo) and that there is a special way to open Ritter Sport bars (shown in the video below). While I may never get the knack of that and opt to tear it open instead, I will definitely be buying more of these bars, as gifts and for myself, and can’t wait to see what other vegan varieties the brand introduces!